With the team event and men's singles over, Olympic figure skating has moved onto the ice dancing competition. 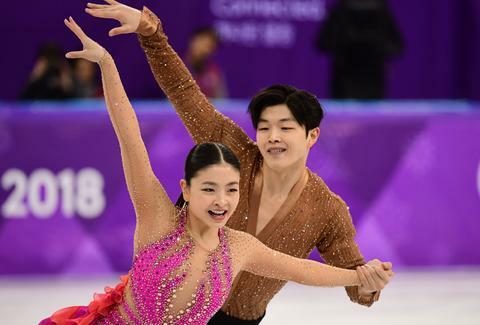 Viewers in the US are getting behind the Shibutani siblings -- one of four US pairs competing -- partly because people love their social media presence and partly because of their twizzling. But along with the arrival of ice dancing is the arrival of a question that must be asked once every four years: What the hell is a twizzle? As NBC figure skating host and former ice dancer Tanith White explains in this video, it's a featured element of ice dancing. White says twizzles are "a series of fast rotations, moving across the ice in perfect unison with the partner." White does a nice job not only explaining but showing the move and how ice dancing blades, which are different than the blades for pairs or singles skating, allow skaters to twizzle. The synchronized spins are an important part of the score for ice dancing and are altered by adding features (changes in holds or arm and leg position) to the turns. This is why, if you watch even five minutes of ice dancing, you've heard the word twizzle six thousand times. "What the heck is a Twizzle?" Two-time British Olympian Sinead Kerr has also demonstrated twizzles for curious viewers. Her video also shows viewers how to spot a sit spin and a toe loop in addition to a twizzle. The difference you'll note in ice dancing is the two performers in ice dancing will perform synchronized twizzles. Here's a look at the Shibutanis getting their twizzle going toward the end of their short program, broadcast Sunday in the US. They'll finish up their twizzle extravaganza in Monday's US broadcast. The flurry of twizzles have sent people into tizzies. Some viewers are having fun with it, and some viewers are ready to see twizzles die a fiery death. Is anyone else tired of hearing “twizzle”? Do you even twizzle bro? Dustin Nelson is a News Writer with Thrillist. He finally gets Twizzlers. Follow him @dlukenelson.